Lately, I’ve been on a bit of a craft brew kick. Actually, that’s an outright lie. I’ve been obsessed. Since leaving San Diego, I have been searching for the camaraderie and creativity that only craft brewing has been able to give me. Don’t get me wrong, there are lots of useful pursuits out there. But not many are as interesting as the purposeful brewing and joyful consumption of my beloved beer. My buddy Dave and had I brewed our own Double IPA. I guess what I’d like to say about it (because the wound is still a little open) is that it was a learning experience. 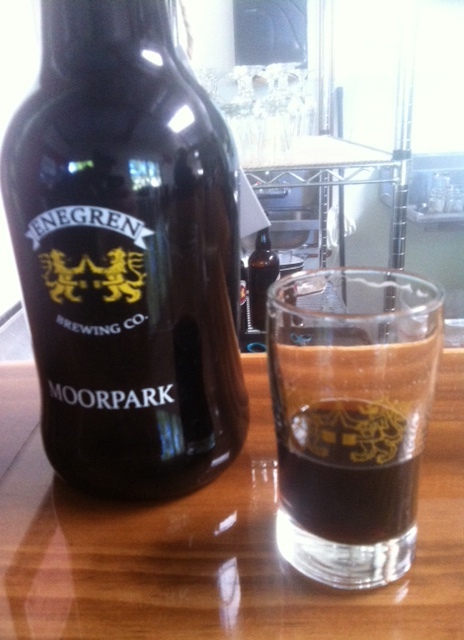 Looking to increase my knowledge in local beers, as well as a way to drown my sorrows, I decided to go find a small brewery in Moorpark called Enegren Brewing Company. The people of Enegren embrace this counter-culture approach to beer. When you walk into their tasting room, the smell of a fresh batch of grain, boiling with anticipation of its destiny, often hangs in the air. On the wall, displayed like a work of art, is the schematic for their brewing operation. Rather than hiding their process from “the competition,” they seek to educate and inform on how this nectar of the gods is made. Anyway, enough soliloquy on the freedom of beer. Here’s what I think about the brewery that is Enegren. 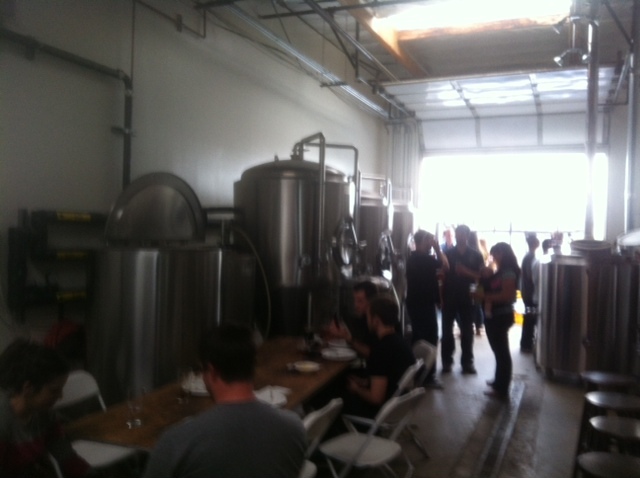 The inside of the brewery is simple yet inviting. There’s a nice little bar that seats about 5-6 people and several bar tables accommodating 4 each. Hung on the wall is a LMU flag that represents the eden in which Enegren beer making dreams took root. Above the door, a huge public notice sign sits, prompting Chris to tell me about how hours and hours of research for a presentation before the Moorpark City Counsel was ultimately in vain when their application for a license breezed through. Beyond the tasting area is where the magic happens, and if the guys aren’t busy working on their latest batch they are more than happy to give you a tour. 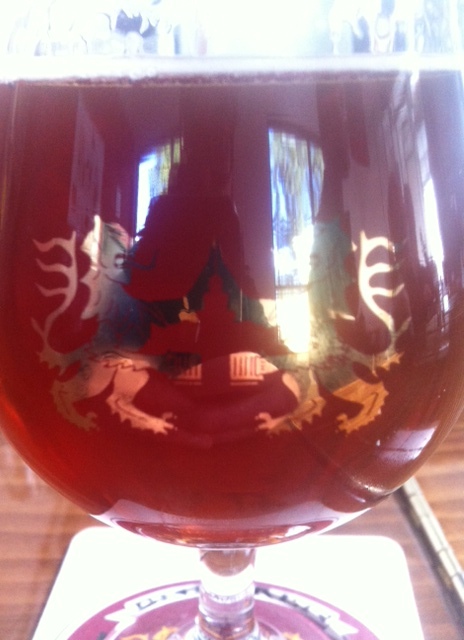 The “Valkyrie” Alt is light and fruity but well-balanced and not too sweet. I’m told this is their most popular beer. The “Protector” IPA is hoppy and complex. It stands up against some of the best I’ve had from SD. The “Contradiction” Black IPA was interesting and took some getting used to. I didn’t get the hop notes at first (probably because my palate had been blown away by the Fleur de Mars) On subsequent passes, the hop came through nicely and the smoothness belies the 7.7% alcohol this bad boy is packing. Then there is the Oatmeal Stout. They call it the “Daniel Irons” and it is my favorite of the group. It has delicious notes of chocolate and a mouthfeel that bathes your tongue in what could only be described as a decadent adult milkshake. I prefer it a little colder than the typical stout, so having it right out of the tap at the brewery is perfect for me. If I could affix my lips directly to the tap, I would. 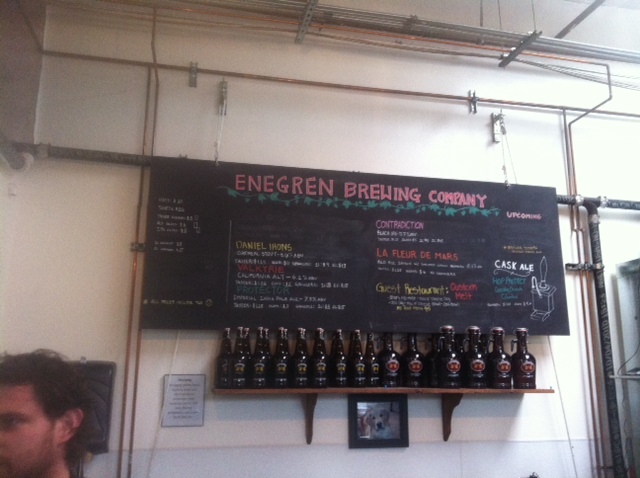 As I mentioned before, Enegren allows you to purchase growlers to take home. They come in 1L and 2L varieties and, due to California law, they can only fill their own glass. It’s okay though, because a 1L glass will run ya eight bucks and a 2L fifteen. Basically you pay the 2x the cost of a normal fill, but you keep the glass and can refill it as many times as possible. Honestly, these things pay for themselves. I currently have two 1L growlers (because I like variety and hate sharing) and I usually take them in once a week to be filled with Daniel Irons and whatever else I’m in the mood for. That reminds me, the brewery keeps some odd hours due to the fact that all of the owners also have day-jobs. They are open from 11-8 on Saturday and 12-5 Sunday. If you need a fix during the week, they are open from 6-9 on Wednesday and 7-9 on Friday. 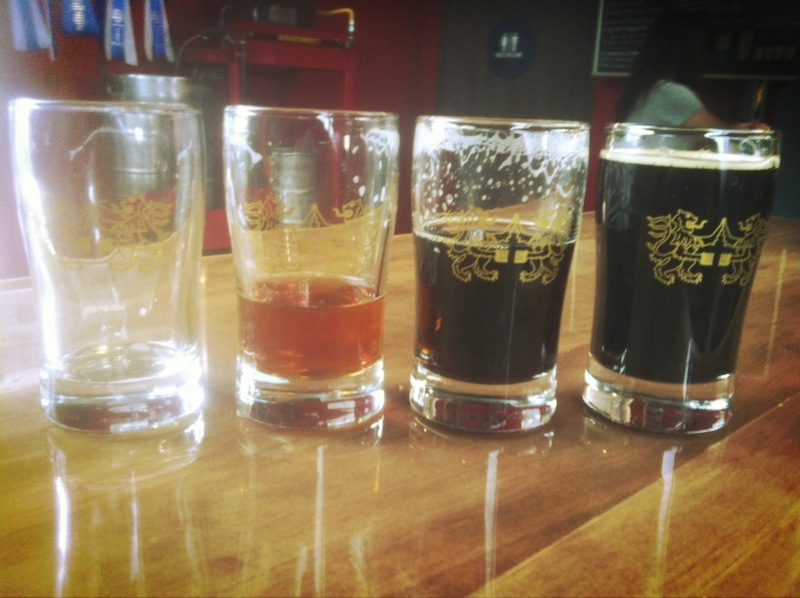 By this point I’m sure many of you are wondering why a brewery is appearing on a food blog. Well, thanks for bearing with my gushing over the beer for this long. 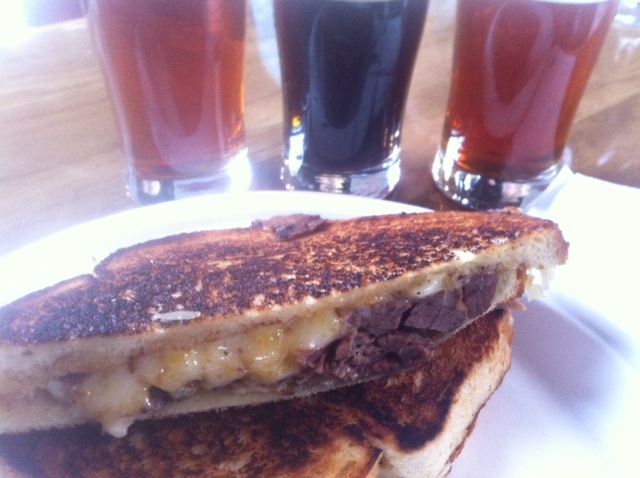 The reason I decided to include Enegren in this post isn’t because of the epic food they serve (they don’t serve any), but because of their recent collaboration with a gourmet grilled cheese shop across town called Custom Melt. Along with the short rib melt, they offered mac & cheese, grilled cheese and a hot dog topped with mac & cheese on a bun. The price for each was $5 and the value was tremendous. Granted, I only ate the sandwich, but I found the meat to be tender and juicy and the combination of the brie and an interesting horseradish aioli was a good pairing. One bite had a bit too much horseradish, but it’s cool because I needed my sinuses cleared out anyway. The above photo was taken after the crowd died down a little, but if Enegren keeps brewing great beers (and bringing in delicious food) then people will eventually flood the place and allow these guys to focus on their beer pursuits full time. In the meantime, I think I’ll enjoy my hidden little local brewery for just a little while longer. Great to see this much detail on local breweries for those who aren’t familiar with how things work. I think many of us take it for granted all the things we have come to expect after going to brewery after brewery but many are not aware of what makes these places different. What I love the most though is none of the breweries around me have TVs on. I know if there is a game on, they aren’t going to be showing it. This means people are there to enjoy beer or meet with friends and not so much to catch a game. This also means if you want to escape a big game, go to a brewery. Thanks for the shout out! 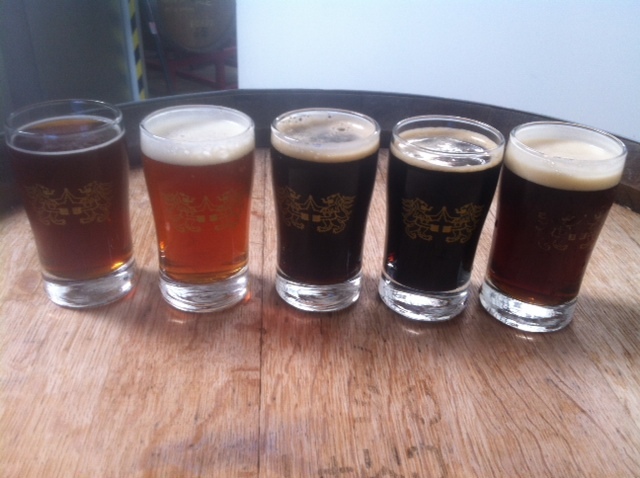 Looking forward to your next visit to the brewery!